No matter what the occasion, we have a personalized notebook design for you! Choose from over 200 images and even more color combinations, then add names and an event date for a memorable favor that all your guests will love. Each 3 1/4" x 4 1/4" notebook is perfect for tucking in a purse, pocket or vehicle so you'll always have something to write on when you need it. The added bonus with this favor is a miniature white pen that tucks securely into the side of the notebook, keeping pad and pen together at all times! Minimal assembly required to adhere the personalized labels to the favors. Note: Please use our designer to see a preview of how your personalization will appear on the product.Note: For sample orders, you will not be able to specify personalization. Your item will consist of a random representative sample. You can select the color using the designer tool after adding it in your shopping cart. Hi. I just want to make sure I'm getting the right colors. This states that the border or the bottom color is black. I want to make sure that I'm getting black. Can you verify for me, please? 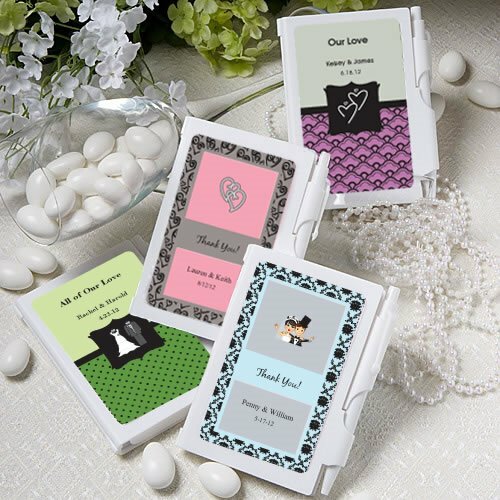 Yes, the midnight Border or Bottom Color of this Personalized Notebook Favor is black. You can also select the Background or Top Color, Pattern Color as well as the font color to make it even more personalized.